Looking for advice on the best baby carrier, stroller or teething toy? Or need help choosing the perfect gift for a special tot in your life? The Tot Product Experts are here to answer your questions! Q: What is the best car seat to go with the bugaboo donkey2 duo? 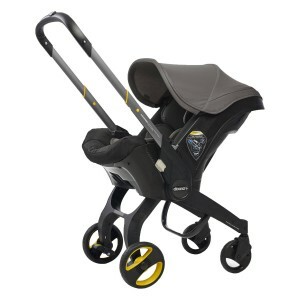 A: The following car seats are compatible with the Bugaboo Donkey Duo: Cybex Cloud Q Plus Infant Car Seat (13.9lbs). We have a couple of colors/styles – Midnight Blue and Manhattan Grey. 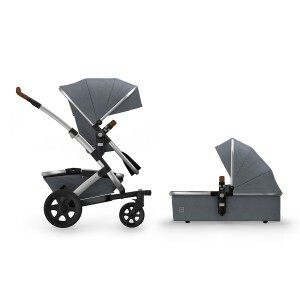 There’s also the Cybex Cloud Q Infant Car Seat (12lbs) collaboration featuring prints by Jeremy Scott and Anna K. Also compatible is the Nuna Pipa Car Seat and Base Set (8lbs) which comes in Night and Graphite or the Nuna Pipa Lite which is a more lightweight car seat weighing in at 5.3lbs! All the car seats require an adapter to be used with the stroller. Each brand has its merits so it can depend on a whole range of things. Some factors to consider include budget, materials used, style, weight, size etc. We suggest that you head over to our car seat section on The Tot to find out a bit more. We also have two really helpful articles which may assist: 1) Which car seat is right for you and 2) the 10 most common mistakes parents make when installing car seats. A: We love the Solvej Baby Swing which is suitable once your baby is able to sit upright without support. The swing is extremely safe. It is made from 100% organic hemp and features non-toxic finishes which is really important since babies love to chew on things! It’s easily transported indoors and out and we particularly love it because it grows with your child and can be used up until about 6 years of age or 88lbs. We also have a great selection of baby bouncers which range in features from the simple, but super popular, BabyBjorn Balance Soft Bouncer to the new 4Moms MamaRoo that features bells and whistles like white noise options plus 5 unique motions that mimic a car ride, tree swing, wave and more! We recommend that you take a look at our Bouncer, swings & jumpers section under Gear for more options. Q: What’s the best and safest convertible car seat? 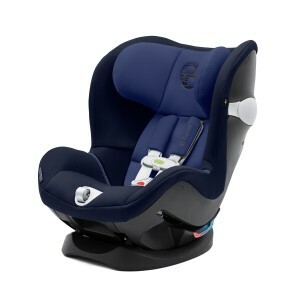 A: We have a range of excellent convertible car seats for you to consider. Clek’s Mammoth Wool Fllo is a pretty great option because it is free of flame retardants and the fabric is made from 100% wool which has its own natural flame retardant properties. It’s a narrow seat coming in at under 17” at its widest yet it still provides best in class safety features like an anti-rebound bar which improves stability by limiting rotation of the seat while also protecting your child’s head from impact in the event of a collision. 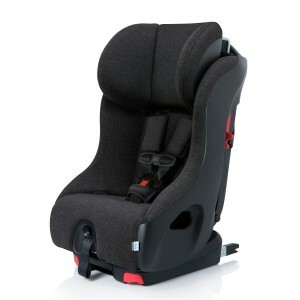 The seat also features an aluminium honeycomb safety system which is designed to reduce the forces transmitted to a forward-facing child in a collision. The Clek Wool Foonf has all the same safety features plus extended rear-facing capabilities. We also have the Cybex Sirona M Car Seat which features a SensorSafe system that alerts caregivers if a child is accidentally left in a car or if the child unbuckles themselves while the vehicle is in motion. It features rearward installation up to 40lbs and forward installation up to 65lbs, a 12-position adjustable headrest and an energy absorbing shell in the event of a collision. We hope this helps! We have a great article on our site which may help: How to choose the right car seat. Q: What’s the best baby carrier and teething toy? A: Let’s start with carriers… It all depends on you and what you’re after. There are two main options – A structured carrier or wrap/ sling carriers. We stock both styles on The Tot and each product has been tested for safety, comfort, style and ease of use. What one mom (or dad) loves, another might not. So, how can you figure out which type of carrier is right for you? Try before you buy. Ask other moms to try their carriers or bring your baby to the store and ask for a demo. You’ll quickly get a feel for the type of carrier you feel most comfortable with. You should also think about how long you plan to use your carrier. Some models can be used without an infant insert from birth, but they generally only last until 12 to 15 months. Others can last well into toddlerhood, but you’ll probably need to buy an infant insert for the newborn stage. Keep in mind that only the most dedicated baby-wearers still want to use their carriers once their child weighs more than 20lbs because they can start to be uncomfortable – especially slings and wraps that offer less support than structured carriers. We stock carriers from Stokke, BabyBjorn, ErgoBaby, Cybex and Baby K’tan. 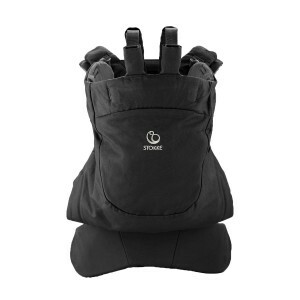 Our best sellers are the ErgoBaby Four Position 360 and the BabyBjorn Carrier One – Ergonomic edition. As for teething toys, there are a few things to take into consideration. The most important thing is to choose non-toxic teething toys that are made with safe materials — you don’t want your baby ingesting anything nasty. You also want a toy that your baby can grasp onto easily — nothing that’s too heavy that might drop on their face and hurt them if they’re lying down. We have a huge range of cute, safe and practical teething toys and accessories on The Tot. We also sell teething necklaces for moms which are really popular as you get a necklace and baby gets a teething toy in one! Just head to Feeding/Nursing/Teethers on thetot.com. All of our teethers are free of BPA, phthalates, lead, cadmium and PVC. Q: I’m starting solids with my 4.5 month old! What type of food do you all love? And what are the best high chairs that he can grow into? A: This is an exciting (and messy) milestone! We have a fantastic range of highchairs available on The Tot for you to choose from. So it all comes down to factors like budget, taste, space and longevity. We love the Stokke Tripp Trapp Highchair because it grows with your child right up to adulthood – so your tot will absolutely be able to use the Tripp Trapp as a homework chair one day! It’s well made, stylish, easy to clean, safe and durable. The chair is crafted using solid beechwood and non-toxic finishes and includes a 5-point harness for extra safety along with a Tray, Cushion, Baby Set and Frame. We have a range of great colors on our website so please take a look by going to thetot.com/feeding/highchairs. As for baby solids, head to our site and read our helpful guide on Baby food stages and what you’ll need. There’s some great info in there on what to feed them and what not to feed them! Q: What’s the best double stroller for two under three? The first will be about two and a half and a newborn as well. I need something that isn’t too big and bulky and is easy to fold up. 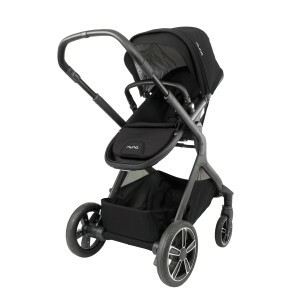 It’s a bonus if it can convert to a single stroller and if it’s compatible with the Nuna Pipa! A: There are three main types of double strollers that come with different advantages and disadvantages. 1) Tandem Strollers: Tandem strollers feature seats placed one in front of the other. They’re no wider than a single stroller, but they can be heavy and bulky when folded up. However many parents find their width more practical than side-by-side strollers. 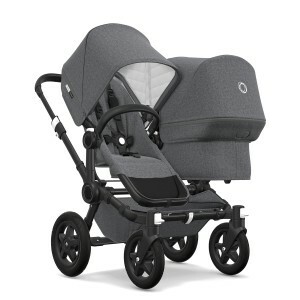 The Joolz Geo² Studio Duo Stroller is our top tandem pick. Featuring a modular design that offers three different configurations – seat with extra-large storage basket, seat and bassinet, or two seats – it grows and adapts along with your family. And at just 24 inches wide, the Geo² Duo won’t cramp your style no matter what configuration you’re using. 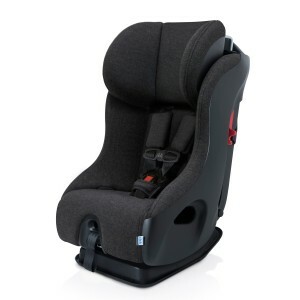 Then there’s the Nuna Demi Grow which is perfect for your car seat compatibility. It’s incredibly functional and easy to convert from a single to a double stroller. Start with the DEMI Grow Stroller Frame, which features an all-season seat, large stroller basket, extendable UPF50+ canopy, custom dual suspension and tough terrain tires. When you need to convert it into a double stroller, simply add the easy-to-attach DEMI Grow Bassinet, which is approved for overnight sleeping and perfect for traveling. Once your wee one has outgrown the bassinet, swap it for the DEMI Grow Sibling Seat and you’re all set! With its 23 modes, the Nuna DEMI Grow can adapt to your family’s changing needs. Next there are the side by side strollers – The Bugaboo Donkey Duo 2 is our most popular. One of the most versatile double strollers on the market, it easily converts from mono to duo to twin stroller with a few simple clicks. In the duo configuration, you can place a bassinet (or car seat) and a reversible seat side-by-side, and then two seats side-by-side as your children get older. With one seat facing forward and one facing backward in duo mode, you can easily separate squabbling siblings by pulling up their sun canopies and creating two distinct spaces – genius! Finally, there are jogging strollers. The Bumbleride 2018 Indie Twin Stroller is a double stroller like none other. Even though it features four wheels like a traditional stroller, its all-wheel suspension and lightweight frame make it easy to maneuver while walking or jogging over any kind of terrain. You’ll forget you’re even pushing it as you fly down the streets of your neighborhood! And it receives top marks for safety and sustainability too: not only is it Oeko-Tex Standard 100 Class I certified to be free from harmful chemicals, it also features durable fabrics made from 100% recycled PET bottles. Q: Would you use the Doona car seat over the standard infant car seats? A: We love the Doona and it’s one of our best sellers on The Tot. So it all depends on personal taste and requirements. Our Doona customers tend to travel a lot or live in urban areas with smaller space so they want more compact options. We recommend that you hop onto thetot.com and take a look at our article Which car seat is right for you. It will hopefully give you a good overview on the different options.